I made Spiced Rum Balls and Penzey’s Chicken and Bacon 3000 Poppers for snackin’ tonight. Preheat oven to 350°. Spray a flat roasting rack with non-stick cooking spray, place on a foil-covered roasting or broiling pan and set aside. Cut the chicken breasts into 1-inch cubes. Cut each bacon slice into thirds. It is easiest to do this before you separate the bacon into slices. 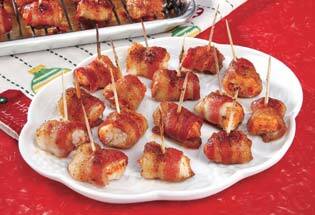 Wrap a piece of bacon around each chicken cube and secure with a wooden toothpick. Combine the BBQ 3000 with the brown sugar. Drop each meat skewer into the mixture and toss gently with your fingers until completely coated. Arrange the poppers on the rack and bake at 350° for 30-35 minutes, until the bacon is crisp and the topping browned.